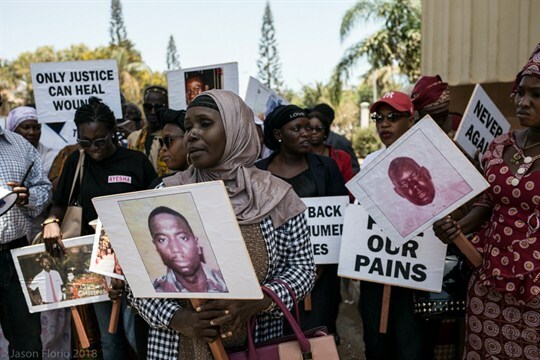 Relatives of victims of the regime of former Gambian President Yahya Jammeh participate in a demonstration to demand information about what happened to their loved ones, Banjul, Gambia, April 17, 2018 (Photo by Jason Florio). BANJUL, Gambia—In July 2005, Martin Kyere, a 25-year-old shoe-seller from Kumasi, in northern Ghana, set off for what he hoped would be a better life in Europe. He took with him a small bag containing some clothes and biscuits, and $1,400 sewn into his underpants.